We’d love your help. Let us know what’s wrong with this preview of Paul, Apostle of Christ by Angela Elwell Hunt. Paul, Apostle of Christ is the story of two men. Luke, as a friend and physician, risks his life every time he ventures into the city of Rome to visit Paul, held captive in Nero's bleakest prison cell. Before Paul's execution, Luke resolves to write another book, one that details the beginnings of "The Way" and the birth of what will come to be known as the church. But Ner Paul, Apostle of Christ is the story of two men. Luke, as a friend and physician, risks his life every time he ventures into the city of Rome to visit Paul, held captive in Nero's bleakest prison cell. Before Paul's execution, Luke resolves to write another book, one that details the beginnings of "The Way" and the birth of what will come to be known as the church. But Nero is determined to rid Rome of Christians. To ask other readers questions about Paul, Apostle of Christ, please sign up. I can not say enough to explain how good this book was. Although this book was fiction the book has many things that were happening in Rome around this time. It tells the story of how the book of Acts was written. I love this book and I can't wait until another book like this one and Risen comes out. Oh how I grieved over the abuse and sheer darkness of Rome during Nero's rule. A time when Christians faced sever, bloody persecution. A time rivaled with the Holocaust. Sheer hatred and scorn. And in this time the lives of Paul, Luke, Priscilla, and Aquila entwine to further the cause of Christ amidst evil, fear, and confusion. I cried, questioned, and speculated with the author about the end of Paul's life. This has to be one of my top favorite books....I love seeing the people in the Bible become real people. Growing up I thought they were all perfect. But to see the God used people that had no special talents or messed up in a big way has made me look at God and life with a better perspective. Paul, Apostle of Christ is a work of fiction. About actual people who existed long ago. Set to be released after the anticipated motion picture. Quite the tall order for author Angela Hunt to create a compelling, convincing novel you won’t want to put down. What better way, I thought, to measure the merit of the book than reading it through the eyes of a suspicious skeptic and heart of a convicted Christian? How well does the storyline stack up as an accurate reflection of the Bible and what hist Paul, Apostle of Christ is a work of fiction. About actual people who existed long ago. Set to be released after the anticipated motion picture. Quite the tall order for author Angela Hunt to create a compelling, convincing novel you won’t want to put down. What better way, I thought, to measure the merit of the book than reading it through the eyes of a suspicious skeptic and heart of a convicted Christian? How well does the storyline stack up as an accurate reflection of the Bible and what history tells us about Rome under Emperor Nero? About three-mile high I would say. If you question it at all, the Interview with the Author and References sections at the back of the book should replace all doubt with answers. But you won’t have to. Like an intricate stain-glass window that displays a unified image letting in the light, the fragments of fiction come together with what we know for sure to complete a viewpoint that opens the eyes of our understanding. And casts things more clearly. With details acting like the filler soldering the picture together, the skeptic eye and Christian heart get a closer look at the conditions in first century Rome. And a revealing snapshot of the minds and hearts of the real-life and imagined characters. It offers a front-row seat to what Rome was like back then. The point of view of the Romans, particularly those with power, comes into sharper focus. We get to see how the Pharisees became so law-obsessed and the nasty jealousy that drove the desire to rid themselves of Jesus. We gain deeper insight into Saul’s zeal for the Law and source of persecution for Christians. And his remorse over the harm he had done. Paul’s blinding encounter with Christ and missionary journey take on a whole new dimension. Words, like laser-sharp 3D glasses, whisk us straight to Paul’s side, sharing his experience in the dunk, dusky, stinky prison. We are moved by his friendship with Luke, the physician and writer of Acts, where the inspiration for the book and movie stems from. We come face to face with the brutal persecution and the faith and love of early Christians such as Aquila and Priscilla. People who “had a strange affection for widows and ugly orphans.” Hunt adds credibilty with authentic vocabulary from that era. Scripture was also brilliantly and seamlessly interwoven, the Word of God hemmed in context and meaning. The novel takes you on a journey into the past where you could smell, feel, taste and envision every word she brought to the page. A journey that moves from what happened then to what happens in your heart throughout the book. The author’s unfolding of the “more to this story” is what makes Paul, Apostle of Christ effective and relevant for the suspicious skeptic and convicted Christian . She laid out so many things to think about, remember, and be challenged by. Things like the finding strength to do what’s right and shedding the light of goodness onto oppressive evil darkness; how to serve, love, forgive. That there is a time for prayer and a time to act in faith. From captivating beginning to powerful ending, the “more” is what grabs your heart and attention. And leaves a lasting impression. I'm sure we have all heard horrifying accounts of how Nero burned hundreds (thousands?) of Christians alive, and how they were called Roman candles. But what I never stopped to think about was the details of what could have transpired. I never thought about how some Christians will have walked the streets of Rome with their heads down, minding their own business, only to look up at a clamouring crowd to realize that their friends, their brothers and sisters, were being led captive through the city in order to serve as human lights in Nero's circus that night. How their hearts must have hurt to think that their friends and family were going to be burned that night, and how gruesome it must have been to look over at the orange glow in the night sky, knowing that the glow was Christians going to meet their Creator. That's what this book will do to you. You'll stop and consider details in well-known Biblical stories that you've never thought about. You'll learn about execution methods you've probably never heard about. (Unless you've read all the martyr stories, in which case I won't say for sure.) You'll read about how hard it really was to be a Christian in those days. This book was a slower read for me than most books are, even though it is beautifully written. Some of the scenes described were a little hard to wrap my mind around. Maybe it would've been easier if I had watched the movie. The scenes were descriptive - it wasn't that - just that maybe I don't read a lot of biblical fiction and am unfamiliar with the setting (and the genre in general). In the beginning of the story it is revealed that Paul is in prison, having been sentenced to death but the date of his execution hasn't been set yet. Soon, however, Paul is called outside and they tell him that his execution has been planned for three weeks from then. So with three weeks of time, Luke starts visiting Paul in his cell every night, as his physician, and he writes the last account of Paul's life as Paul dictates. This becomes basically the story that we find in the book of Acts. It includes stories of likely events that could've happened in those days, even though they're not recorded in the Bible. It inspired to me read the book of Acts again, with new images to picture in my mind. Like mentioned above, this book is based on the screenplay of the same title, and it features several pages of photos from the movie in the middle of book, which I liked. The pictures made me wish I had accepted the offer of reviewing the movie after all. So, here are 5 great reasons to pick up a c If you’ve watched the newly released, major motion picture entitled “Paul, Apostle of Christ” from Affirm Films, (and even if you haven’t!) the novelization written by Angela Hunt is also a definite must-read. Based on the screenplay by Andrew Hyatt and published by Bethany House just before Easter 2018, this powerful story sweeps us away to the lives of Paul and Luke, and reveals a behind-the-scenes retelling of how “their faith challenged an empire”. 1. It will inspire you! As the stories of Paul and Luke are revealed through a compelling (partially fictionalized) account, their courage to follow the leading of Jesus will encourage us in our own journeys. 2. It will bring the stories of the New Testament to life! Luke was the author of the New Testament books of Luke and Acts, and “Paul, Apostle of Christ” gives us a behind-the-scenes look at how these two inspired books came to be written. 3. It will challenge you in your faith! After reading the accounts of Paul’s life through the fresh eyes of this story, it really causes us to question the strength of our own faith in our own lives and our own daily struggles. 4. It will help you remember the struggles early Christians faced each day! Not only is the story of Paul highlighted in this book, but also the other members of the early Church who lived in Rome during the reign of the cruel emperor Nero. 5. It will give you insight and better understanding of the movie. I watched the movie first, and while it was very well-done and relatively easy to follow, reading the novelization gave me a much clearer and stronger comprehension for each scene. The novel expanded on several storylines, as well. If you have plans of journeying to the theater to watch “Paul, Apostle of Christ”, I definitely recommend reading the book as well. Just like the movie, it does contain some descriptive and horrifying violence, and is definitely not a story for very young audiences. For adults, however, it will undoubtedly prove to be a powerful reminder of the gifts of faith the early Christians - Paul, Luke, and so many others - gave to the world, including you and I, all these years later. Angela Hunt's novelization of "Paul, Apostle of Christ" is a wonder. The film was very good with one of the most powerful finishes in memory (that last minute of the film just swept me up and impacted me for weeks after!) --but the novel takes us deeper into the world of Paul and the threat posed against the people of the Way during Nero's atrocities in Rome. It's a novel that will move you and imprint these two giants of Biblical history into your mind and heart. 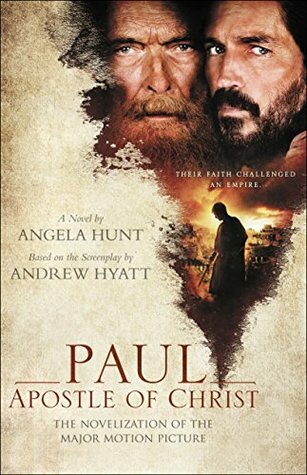 Wonderfully written, I experienc Angela Hunt's novelization of "Paul, Apostle of Christ" is a wonder. The film was very good with one of the most powerful finishes in memory (that last minute of the film just swept me up and impacted me for weeks after!) --but the novel takes us deeper into the world of Paul and the threat posed against the people of the Way during Nero's atrocities in Rome. It's a novel that will move you and imprint these two giants of Biblical history into your mind and heart. “Have you ever been sailing?” Paul asked. And like the film, the ending is beautiful and memorable. I love Hunt's immersive writing but which is kept simple and character-driven. I look forward to reading more of her novels!! Story Originality: How creative was the concept from page one onwards? Story Inventiveness: How surprised was I by the flow of the plot? Any twists? Characters: How real and how drawn was I to the story’s characters? Descriptive Power: How well did the author control description, dialogue, etc? True to Scripture: Were all elements true to Scripture’s worldview? Fictive Dream Strength: How much was I immersed into the novel—wanting to read page after page? Proofreading: How well was the book proofread (typos, etc)? Cinematic Flare: How strong were key scenes (that I could easily see as a motion picture)? Overall Satisfaction: What was my overall feeling/enjoyment level after reading novel? Did I want it to end? I have always been interested in the Apostle Paul, but I must admit this book was purchased on a whim when I was out shopping at the local Sam's Club. I picked it up and thought I would buy it in case I had time to read something later in the summer. I started it on one Saturday and finished it on the following Saturday. When I picked it up I found myself wanting to read just a little more. When I read for leisure, I usually read at night to relax and prepare for bed. With this book, I wanted to I have always been interested in the Apostle Paul, but I must admit this book was purchased on a whim when I was out shopping at the local Sam's Club. I picked it up and thought I would buy it in case I had time to read something later in the summer. I started it on one Saturday and finished it on the following Saturday. When I picked it up I found myself wanting to read just a little more. When I read for leisure, I usually read at night to relax and prepare for bed. With this book, I wanted to read more often just to see what was going to happen next to Paul and the others in the book. 15.0% "It's great material if you are into bible and religion... if you want to learn more about this topics here it's the best place." October 9, 2018 – Started Reading"
- It's strange what people do for the name of faith this book is an example how far faith goes... where is written that human sacrafice is necessary? It's not a Good excuse to take an human life... it's just not an excuse! Even though fiction is blended with Biblical truth, you feel as though you are there with not only Paul and Luke, but also with Aquila and Priscilla and the others as they strive to live and die for their Saviour, our Lord Jesus Christ. This story will bless you and remind each of us how we truly should be living. You will want to keep the tissues handy. Excellent read on how life may have been for the early Christians. Hunt always has such interesting details and is able to lace her characters in authentic situations. I am so glad to have read this book after studying the book of Acts. This gave me a 3D perspective on Paul’s life, struggles, and ministry. Early believers had such deep, strong faith to endure torture and fear. Christians today have much to learn from those who have live - and died - before us. Good job. The book kept me interested throughout. I am nevertheless still skeptical that Jesus actually appeared to Paul in the desert. His companions vaguely heard voices but it is weakly supported. It is remarkable that the civilized world for centuries so readily accepts this claim. A wonderful movie based on the Bible. Luke risks his own life to visit Paul who is being held captive in a Roman prison.under the ruling of Nero. They struggle together to spread the word of Christ. A wonderful book and going to be a wonderful movie. I wish that I had read the book before seeing the movie. I loved this telling of Paul's last weeks of his life and the writing of the Book of Acts (of the Apostles). I haven't yet seen the movie but am eager to do so now. Now that her two children have reached their thirties, Angie and her husband live in Florid Christy-Award winner Angela Hunt writes for readers who have learned to expect the unexpected in novels from this versatile author. With over three million copies of her books sold worldwide, she is the best-selling author of more than 100 works ranging from picture books (The Tale of Three Trees) to novels. Angela admits to being fascinated by animals, medicine, psychology, unexplained phenomena, and “just about everything” except sports. Books, she says, have always shaped her life— in the fifth grade she learned how to flirt from reading Gone with the Wind. Her books have won the coveted Christy Award, several Angel Awards from Excellence in Media, and the Gold and Silver Medallions from Foreword Magazine’s Book of the Year Award. In 2007, her novel The Note was featured as a Christmas movie on the Hallmark channel. Romantic Times Book Club presented her with a Lifetime Achievement Award in 2006.